The SkyMate system using the Orbcomm low earth orbit satellites at VHF frequencies. Only a regular VHF whip is needed to communicate with the Orbcomm satellites. The coverage is not completely global, but covers most of the continental offshore waters around the globe except Southern and Eastern Africa for some reason. The box costs between about $1200-$2000 depending on the features you select. You can choose between the basic SkyMate 100 box for $1199, the Sentrymate which includes a bilge level; switch, AC/DC power monitoring, and two additional user defined inputs for a total of $1500. 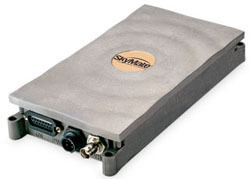 The SkyMate 200 includes an internal 12 channel GPS receiver with NEMA input capabilities as well as the antennas and cables for $1600. Combined with the bilge level sensor, the AC/DC power monitor and the two additional inputs for a total of $2000. Service is billed by the month. There is no annual contract and no fee to switch service plans. SkyMate’s flexible service plan program means you will never pay for service you don’t need. All service plans include two free automatic position reports daily, and no extra charge for the SentryMate monitoring service. Platinum Plan: Send or receive 50,000 characters per month for just $69.99. Additional data costs only $1.40 per 1000 characters. Gold Plan: Send or receive 20,000 characters per month for just $34.99. Additional data costs only $1.90 per 1000 characters. Silver Plan: Send or receive 8,000 characters per month for just $17.99. Additional data costs only $2.25 per 1000 characters. DryDock Plan: When you're not using your boat for at least 3 months, pay just $6.99 a month to maintain your account and continue enjoying access to your online mailbox. Bear in mind that a character includes spaces and punctuation. A $99 one time fee charged upon activation. 21115 visits to this page since 28 Nov 2012.